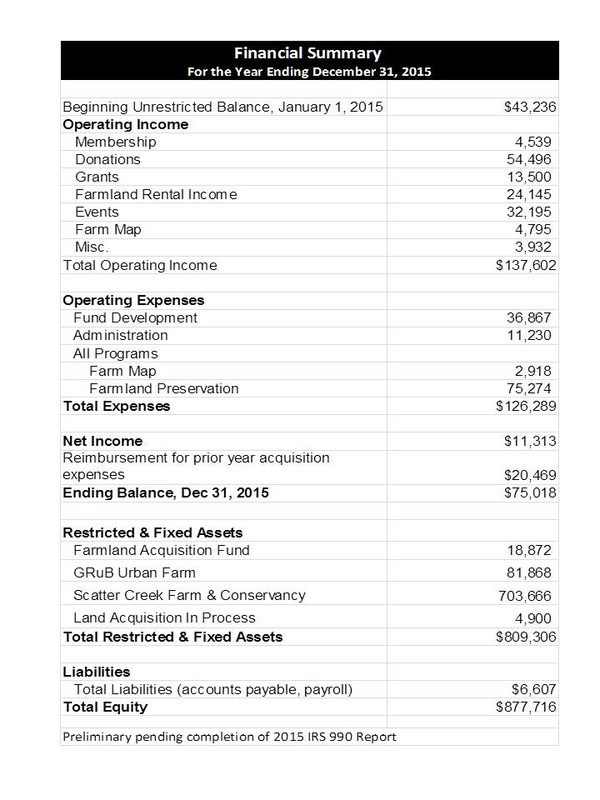 I am pleased to report that South of the Sound Community Farm Land Trust grew significantly in 2015. We expanded our farmland preservation work and continued our investment in the growth of the organization. We succeeded in preserving the 1.2 acres of urban farmland used by Garden Raised Bounty (GRuB) for its agriculture-based youth empowerment program, a project we’ve been working on since 2012. At the same time, we applied for, and were awarded, funds from Thurston Conservation Futures to acquire our first agricultural conservation easement. The funds will allow us to permanently protect the historic, 39-acre Oyster Bay Farm. Meanwhile, we continued our efforts to steward Scatter Creek Farm & Conservancy, including partnering with local nonprofit Enterprise for Equity to launch Thurston County’s first farmer incubator program. Wobbly Cart Farm and August Farm make use of the farm buildings to grow their businesses. Kirsop Farm continues to expand the number of acres under cultivation on their leased land at the farm, with plans underway to expand infrastructure as they plot their future in south Thurston County. With your continued support of our mission, and the work of our board members and other volunteers, we have been able to strengthen our organization. At the 2015 retreat the board set short term goals including focusing on our administrative systems to assure that we have the capacity to uphold easement restrictions in perpetuity. We could not do this work without your support as members, donors and volunteers, so thank you for sharing in our vision. We look forward to connecting with you in 2016. In July 2015, South of the Sound Community Farm Land Trust (SSCFLT) completed the two-year long process to permanently preserve the 1.2 acres of urban farmland in West Olympia used by non-profit Garden Raised Bounty (GRuB) for their nationally recognized youth program. Funded by Thurston County’s Conservation Futures program, SSCFLT’s acquisition protects an irreplaceable parcel of land that yields over 10,000 pounds of produce annually. Food grown on the land is donated to the Thurston County Food Bank, goes home with low-income youth, and is sold at the farm stand and farmers markets to support GRuB’s operations. The acquisition not only helps GRuB continue its important work, but also furthers SSCFLT’s mission to preserve working farmland and keep it accessible and affordable for local farmers. The average age of farmers in the U.S. is 57 and rising, and over two-thirds of the country’s farmland is expected to change hands in the next two decades. SSCFLT views its partnership with GRuB as a way to help train and empower a new generation of farmers and farmland stewards. Enterprise for Equity started their incubator program in the spring of 2015 on 4.8 acres; producing kale, carrots, arugula, beets, parsley, potatoes, lettuce, cucumbers, tomatoes, peppers, bok choy and turnips, with gross sales of $42,600. Scatter Creek Farm & Conservancy not only offers rich land for local crop production, but features an array of buildings that served the historic dairy operation. Today those structures help meet the needs of local farmers and related businesses. SSCFLT leases one of the larger structures, called “Building 8,” to one of Wobbly Cart Farm’s owners, Joseph Gabiou, who in turn leases part of the facility to other local businesses. In late summer Wobbly Cart Farm, located just a few miles away, uses the building as a curing shed for their onions, shallots and garlic. 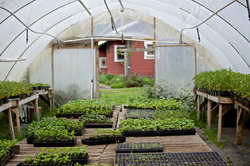 Later in the fall, they use that same space for storage of winter squash and pumpkins. The dry space means Wobbly Cart Farm can provide proper storage for crops sold at the Olympia and Chehalis Farmers Markets, the Olympia and Portland area food co-ops, and to restaurants in the Portland area. Another vital function of “Building 8” is winter storage for farm trucks, tractors, equipment, tools and supplies for Wobbly Cart Farm and their neighbor, Helsing Junction Farm. These farms are located on the rich soils of the Chehalis River flood plain. “Building 8” provides dry storage away from potential flood damage. Elsewhere in “Building 8,” Northwest Aquatic Management, LLC, a firm that provides weed control in area ponds and lakes, stores equipment, and a local dairy farmer stores hay. In the nearby former milking parlor August Farm owners Liza Judge and Marianne Copene, together with Colin Barricklow and Genine Bradwin, owners of Kirsop Farm, operate a chicken processing facility. This facility assures low stress and humane slaughtering of their pastured birds, and the ability to meet diverse customer demand for whole chicken, parts, bone broth packages and chicken feet. The state approved facility means August Farm can sell chicken at farmers markets and through a CSA. They sell to customers in Olympia, Tacoma and Seattle through their Chicken CSA and bulk orders, and at the Olympia Farmers Market – 2,250 chickens in 2015. Kirsop Farm used the facility to process 1,500 birds. 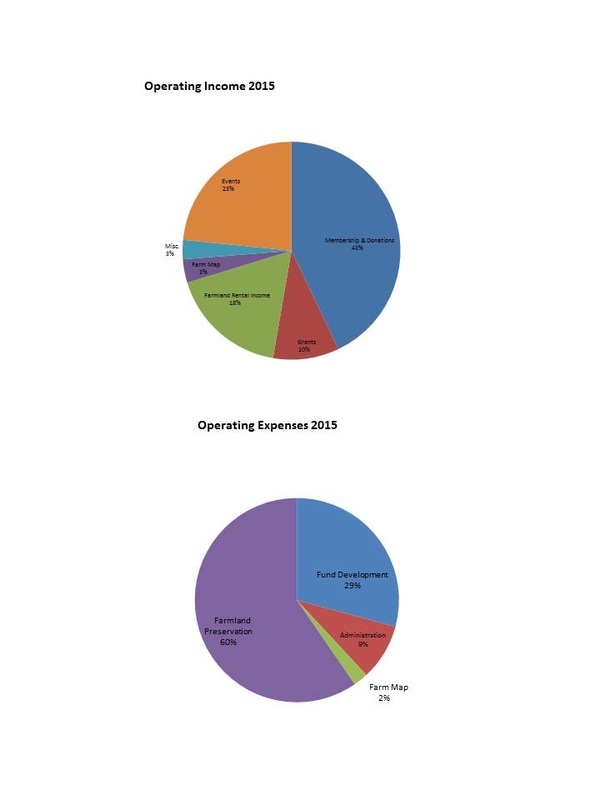 We have steadily increased paid staff hours, and thus the capacity of the organization to achieve our mission. As we start 2016 we have 1.5 FTE staff – Mary Ann Swain, Director of Farmland Preservation (.8 FTE) and, starting in April 2016, Annie Shattuck, Director of Development and Administration (.66 FTE). We are moving into office space rather than asking our staff to work from home. The new SSCFLT office will be located in the Thurston Conservation District offices at 2918 Ferguson St SW #1-A, Tumwater, WA 98512. In an effort to grow our organizational capacity SSCFLT is now a member in the state land trust organization, Washington Association of Land Trusts, and the national organization, Land Trust Alliance. During the past year we brought our message to community groups and increased farmland preservation work with other land trusts in our region. We published another edition of the highly popular Direct Sales Farm Map and hosted the fifth annual, and most successful yet, Farms Forever benefit dinner. None of this would have been possible with your support.